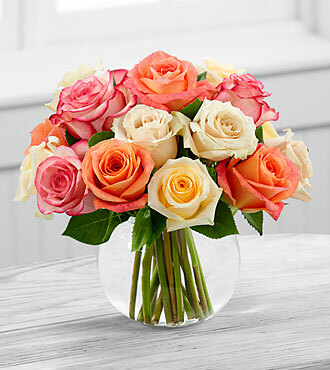 The Sundance Rose Bouquet by FTD employs a soft assortment of roses to create a sweet and stunning arrangement. Cream, white, orange and pink roses are simply brought together in a clear glass bubble bowl vase to make an exquisite flower bouquet set to warm their heart when extending your warmest wishes for their birthday or just to say thinking of you. PREMIUM bouquet is approximately 13H x 15W. "Great Service! Flowers were delivered within 3 hours and they were gorgeous." -- Linda W.